Eight Chilean strains of Dunaliella salina obtained within a restricted geographic range, but exhibiting a high variability in their morphology, rate of growth and carotenogenic capacity, were analyzed by Random Amplified Polymorphic DNA (RAPD-PCR). Twenty of the 50 random primers (D, P, OPA and OPD series) that were tested amplified reproducible bands and were useful for comparative analysis of the strains. Of 107 polymorphic genetic markers, 49 were strain-specific. A great genetic variability was found among the strains in spite of their geographic proximity. In addition, phenetic analysis of the data showed close agreement between the morpho-physiological attributes and the genetic diversity of the strains. Dunaliella salina Teodoresco is a halophilic walless microalga that accumulates large amounts of ß-carotene when cultivated under high light intensity and growth-limiting conditions (Ben-Amotz et al. 1982; Ben-Amotz and Avron 1983; Borowitzka and Borowitzka 1988). ß-carotene is accumulated within oily globules in the interthylakoid spaces of the chloroplast and is composed mainly of two isomers: 9-cis and all-trans (Ben-Amotz et al. 1982, 1988), with 9-cis ß-carotene being the most important for commercial purposes (Borowitzka 1986; Ben-Amotz and Avron 1990; Becker 1994). Dunaliella salina is highly suitable for mass cultivation; its ability to grow in media with high salt concentrations enables it to be cultivated outdoors in a relatively pure culture and with few potential predators. In addition, its high carotene content (which protects it from intense solar irradiation) and halotolerance allow cultivation in arid or desert areas with access to brackish water or seawater (Borowitzka 1986; Borowitzka and Borowitzka 1988; Ben-Amotz et al. 1991). The presence of this microalga in Chile was reported in 1990 (Parra et al. 1990a, b). Eight strains have been isolated since then, all from the northern regions of the country. Previous studies carried out with these strains have shown great variability in morphology, growth rate and accumulation of total carotenes when cultivated under different conditions (Araneda et al. 1992a, b; Cifuentes et al. 1992; 1996a, b). Moreover, quality analyses of the ß-carotene produced by three of these strains (CONC-001, CONC-006 and CONC-007) revealed significant variability in the ß-carotene isomers ratio (Markovits et al. 1993; Gómez et al. 1999). Although the physiological variation detected in the Chilean strains of D. salina presumably reflect genotypic differences, as yet there has been little or no study of genetic diversity in these populations. DNA-based molecular methods have provided new possibilities for studying the intraspecific differences of organisms. Random Amplified Polymorphic DNA (RAPD) (Welsh and McClelland 1990; Williams et al. 1990) allows the detection of multi-locus genetic variation using short primers of arbitrary sequence. In contrast to other standard molecular techniques, such as restriction fragment length polymorphism (RFLP), DNA sequencing, and allozymes, the RAPD technique is very easy to perform and requires no prior knowledge of the genomes under investigation (a general review in Weising et al. 1995). At the intraspecific level, RAPD markers have been successfully employed in microalgae for identification of toxigenic strains in Cyanophyceae (Neilan 1995; Nishihara et al. 1997; Bolch et al. 1999a) and in Dinophyceae (Bolch et al. 1999b). However, studies using this technique for generating genetic markers among strains of microalgae with industrial potential have not been previously published. By using RAPD, this study searched for the presence of genetic polymorphism among 8 Chilean strains of D. salina from very close geographical locations but with striking differences in morphology and physiological behavior. All the strains of D. salina came from the north of Chile; one of them (CONC-001) from the La Rinconada pond, a thalassohaline water body located 30 km north of the city of Antofagasta (23°39'S; 70°24'W) and the other seven (CONC-003 to CONC-009) from the Salar de Atacama, a 3000 km2 salt-flat at 2340 m above sea level (23°30'S; 68°15'W). Unialgal cultures of all of these strains are maintained in the Microalgae Culture Collection, University of Concepción, Chile. The strains were grown in Johnson medium (Borowitzka and Borowitzka 1988) with 15% NaCl under a continuous photon flux density of 100 µmolm-2s-1 and 25±2 ºC. In order to obtain axenic cultures, exponentially-growing cells were washed three times with fresh medium by centrifuging at 2000 rpm for 5 min. The cultures were treated the following day with an appropriate volume of an antibiotic mixture to obtain a final concentration of 200 mg l-1 penicillin, 100 mg l-1 streptomycin and 20 mg l-1 chloramphenicol (Hoshaw and Rosowski 1973). After 5 days, 1 ml from each tube was transferred aseptically to flasks containing 50 ml of antibiotic-free culture medium. Total DNA was extracted from 50 ml of 21-day cultures. Cells were collected by centrifugation at 5000 rpm for 5 min; the pellet was resuspended in 500 µl of TEN buffer (Tris pH 8 10 mM, EDTA 10 mM, NaCl 150 mM), vortexed, centrifuged 10 s, and the supernatant discarded. The cells were resuspended in 150 µl of sterile distilled water to which 300 µl of buffer SDS-EB (SDS 2%, NaCl 400 mM, EDTA 40 mM, Tris pH 8 100 mM) was added. The proteins were extracted once with 300 µl of a phenol:chloroform/isoamylic alcohol (24/1) [1:1] mixture, and stirred by vortexing. The aqueous phase was separated by centrifuging and re-extracted with 300 µl of chloroform:isoamylic alcohol (24:1). The aqueous phase was separated again by centrifugation, the DNA was precipitated by adding two volumes of absolute alcohol at -20°C for 1 hr. Finally, it was centrifuged at 13000 rpm for 5 min, and the pellet was washed with 200 µl of 70% ethanol, dried and re-dissolved in 150 µl buffer TE (Tris pH 8 10 mM, EDTA pH 8 1 mM) until use. RAPD amplifications employing the polymerase chain reaction (PCR) were carried out in a 25 µl volume containing 10 ng of genomic DNA, 1X reaction buffer, 1.5 mM MgCl2, 0.1 mM each of dNTP, 0.2 µM primer and 1 U of Taq polymerase. A total of 50 primers of arbitrary sequence and 10 bp in length from the D, P, OPA and OPD (Operon) series were used. The PCR reaction was carried out in a Perkin Elmer thermocycler with the following program: an initial denaturation step of 94ºC for 6 min followed by 35 cycles of denaturation (94ºC, 1min), annealing (45ºC, 2 min) and extension (72ºC, 2 min) with a terminal extension of 72ºC for 6 min. In order to ensure reproducibility, RAPD patterns from two independent axenic cultures were obtained for each strain, and PCR for each DNA sample was replicated at least twice. The amplified fragments were eletrophoretically separated in 2% agarose gels in TAE at 60V for 90 min, stained in ethidium bromide (0.5 µg ml-1) for 15 min, and photographed under a UV transiluminator with Polaroid film 667. The phenetic analysis of the data was carried out with the unweighted pair group method with arithmetic mean (UPGMA) using the PAUP version 4.0 beta program. Only 20 primers (Table I) generated appropriate amplification patterns (clear bands and low background fluorescence) and were used in the comparative analysis among the strains. As observed in Figure 1, RAPD analysis revealed a high degree of genetic polymorphism among some of the strains of D. salina analyzed. The number of RAPD bands generated per primer varied between 1 (P-8 primer) and 11 (OPA-18 primer). A total of 107 reproducible bands were scored, ranging in size from 300 to 2000 bp. Figure 1: RAPDs patterns of the Chilean strains of Dunaliella salina with the primers P-2 (a), P-3 (b), P-10 (c), P-100 (d), OPA-01 (e), OPA-10 (f), OPA-18 (g) and OPD-16 (h). Lanes 1: 200 pb DNA Ladder, 2: CONC-001, 3: CONC-003, 4: CONC-004, 5: CONC-005, 6: CONC-006, 7: CONC-007, 8: CONC-008 and 9: CONC-009. All of these markers were polymorphic as none was present in the 8 strains under study. On the other hand, 49 of them were strain-specific: 26 for CONC-001, 2 for CONC-003, 19 for CONC-006, and 2 for CONC-007. Within the group, the strains that were genetically most dissimilar were CONC-001 from the La Rinconada pond and CONC-006 from the Salar de Atacama (Figure 1 and Table II). Within the Salar de Atacama, CONC-006 and CONC-004 showed the lowest similarity value (0.36449; Table II). Strains CONC-008 and CONC-009 were genetically identical and strains CONC-004 and CONC-005 differed in just one band, presenting a 99% similarity (Figure 2 and Table II). On the other hand, CONC-007 grouped with CONC-003 with a similarity value of 0.87850 (Figure 2 and Table II). Figure 2: UPGMA clustering analysis obtained from RAPD data of the Chilean strains of D. salina included in this study, using the computational package PAUP version 4.1 beta. RAPDs are viewed as having several advantages over other DNA fingerprinting techniques; the methodology is relatively easy to apply, an unlimited number of loci can be examined, and because the primers consist of random sequences that do not discriminate between coding and non-coding regions, it samples the genome more randomly than conventional methods (Lynch and Milligan 1994; Weising et al. 1995). Despite its advantages, RAPD analysis presents some practical problems, for example, it has been claimed that RAPD markers are rather difficult to reproduce (van Oppen et al. 1996). Nevertheless, in our experience, if the conditions of DNA extraction and PCR amplification are correctly standardized, reproducibility of the patterns should not be a problem. In this study, the same RAPD patterns were obtained for each strain of D. salina from different extractions of template DNA and from separate amplification reactions (data not shown). In RAPD analysis, the possibility that products of different loci could have similar molecular weights and become indistinguishable on a gel due to co-migration does exist. Rieseberg (1996) analyzed the homology of 220 co-migrating RAPD fragments in populations of wild sunflowers, finding that 91% were homologous, thus indicating that fragment size similarity is a good indicator of homology, at least among closely-related populations, as is the case with the D. salina strains included in this study. An unavoidable difficulty associated with RAPD markers is that they represent dominant markers, that is, distinction between homo- and heterozygotes is not possible when diploid organisms are being compared (Weising et al. 1995). In haploid organisms such as Dunaliella, this disadvantage disappears because genetic diversity can be assessed directly from the presence or absence of RAPD bands. Despite this significant advantage, the RAPD technique has not yet been used extensively in haploid microalgae; one of the few examples is the study on genetic variation among strains within the toxic dinoflagellate Gymnodinium catenatum (Bolch et al. 1999b). At present the taxonomy of D. salina is based solely on morpho-physiological attributes. True D. salina strains are hyperhaline and capable of turning orange or red under inductive carotenogenic conditions (Borowitzka and Borowitzka, 1988). According to this definition, all of the strains included in this study would belong to D. salina. In order to be certain that these strains belong to the same biological species, it would be desirable to check for interfertility among them; unfortunately, thus far we have not been able to obtain conclusive results from crossing experiments with these D. salina strains. Levels of genetic variation among D. salina strains have been poorly documented. González et al. (1999) compared various strains of Dunaliella based on RFLP analysis of the nuclear ITS rDNA repeats. They included strains of D. salina from Mexico, Russia, Israel [Dunaliella bardawil (nomen nudum) = D. salina] and Chile. 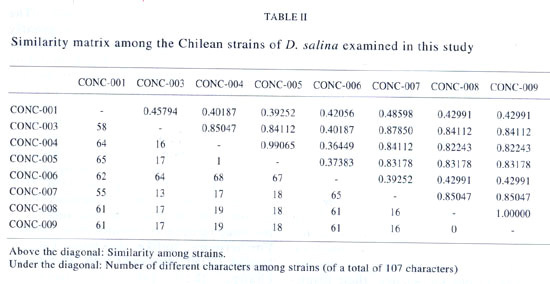 Their results gave higher similarity values among strains from geographically distant locations (Chile and Mexico, Mexico and Israel) than the ones found in this research for the Salar de Atacama strains (Table 2 in González et al., 1999 and Table II this paper), even though they searched for polymorphism in a restricted area of the genome (ITS region) rather than the entire genome (RAPD) as in this paper. The high degree of genetic variability exhibited by some of the Chilean strains of D. salina included in this study is striking (Fig. 2), despite the proximity of their geographical origins. The strains came from two different environments; CONC-001 was isolated from a coastal saline pond (La Rinconda), and the remainder from an Andean saline depression (Salar de Atacama). This could explain why CONC-001 was one of the most genetically-distant strains within the group (similarity range lower than 50%). Surprisingly, the CONC-006 strain was genetically less similar to other strains in the Salar de Atacama (CONC-003, CONC-004, CONC-005 and CONC-007) than to the CONC-001 strain from La Rinconada (see Table II). These RAPD pattern differences acquire even greater relevance when seen in relation to the differences found in the morphology and physiological behavior in some of these strains (Araneda et al. 1992a, b; Cifuentes et al. 1992, 1996a, b; Gómez et al. 1999). Thus, among the studied strains, CONC-006 has the largest cell size (22.5 ± 2.2 µm length, 18 ± 1.4 µm width , Cifuentes et al. 1992) and the lowest growth rate of the group (unpublished observations). The carotenogenic capacity varies greatly among strains. In the Salar de Atacama, CONC-006 is capable of accumulating higher amounts of carotene per cell but less per volume than CONC-004 (125 pg cell-1 and 55 pg cell -1; 29 mg l-1 and 53 mg l-1, respectively) when it is grown in PES + 20% NaCl (Cifuentes et al., 1996b). The CONC-001 strain from La Rinconada, on the other hand, was less carotenogenic per cell ( 49.7 pg cell-1; except for CONC-008) and per volume (30 mg l-1) than any of the strains from the Salar de Atacama under the same medium (Cifuentes et al. 1996b). Furthermore, unlike the other Chilean strains, CONC-006 and CONC-001 do not change their rate of carotenoid accumulation after an abrupt increase of salinity (Cifuentes et al. 1992). The rest of the strains from the Salar de Atacama (CONC-003, -004, -005, -007, -008 and -009) appear to be genetically more closely related (Fig. 2), coincident with their similar cellular size and carotenogenic capability (Cifuentes et al. 1992, 1996b). Furthermore, CONC-008 and CONC-009, which showed no genetic differences, came from the same area of the Salar de Atacama (Torre CONAF). The same is true for strains CONC-003 / CONC-007 (Piular) and strains CONC-004 /CONC-005 ("Burro Muerto) (Fig. 1 in Cifuentes et al., 1992). However, although CONC-006 was collected in the same area as CONC-004 /CONC-005, genetically, it differs the most (Figure 2, Table II). What possible explanations can be found for the high degree of genetic diversity between CONC-006 and any of the other strains of D. salina in the Salar de Atacama be explained? The salty ponds of the Salar de Atacama vary in size and depth, so each may constitute a unique microhabitat subject to a range of environmental stresses and perturbations manifested primarily through changes in salinity. This microhabitat diversity could in turn maintain a genetic diversity by selecting the fittest genotypes for the local conditions in any given pond. Alternatively, it is already known that sexual reproduction in Dunaliella is triggered by specific environmental conditions (Leonardi and Cáceres 1997), which may vary between the different ponds, thus differentially stimulating this type of reproduction and constituting another source of genetic variation. In conclusion, the higher or lower genetic differences detected in the eight strains of D. salina included in this study appear to be closely related to their intrinsic physiological behaviors, indicating that RAPD-PCR is an appropriate biotechnological tool for generating genetic markers, useful in the genetic characterization of highly carotenogenic D. salina strains. Future studies could include genetic manipulation of these or other native strains of D. salina in order to obtain hybrids or mutants with improved carotenogenic capabilities. This work was supported by FONDECYT Grant Nº 2990047 to Patricia I. Gómez. Received: December 19, 2000. In revised form: February 15, 2001. Accepted: February 28, 2001.